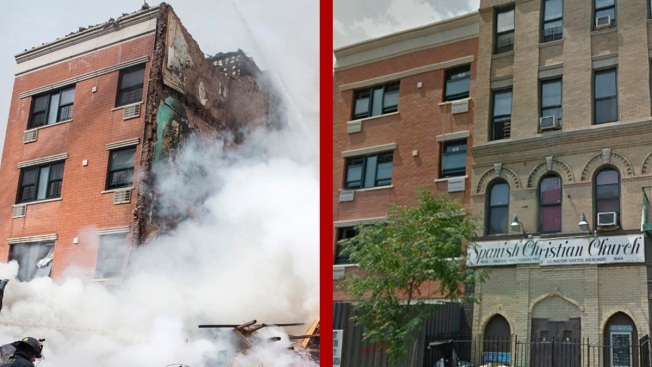 Left: After image of heavy smoke pouring from the debris of a building collapse on Park Ave in Manhattan March 12, 2014 in New York City. Right: Before image of the same buildings from 2011. An upper Manhattan block has been drastically altered after two buildings were leveled by a gas explosion Wednesday. Eight people died and more than 70 were injured in the blast at 116th Street and Park Avenue, which registered on the Richter scale at just under .5, according to Columbia University. The building at 1644 Park Ave. had six residential units, with a ground-floor church, and 1646 Park Ave. had nine residential units, with a piano store on the lower floor.